Review by AllTheBestFights.com: 2016-07-23, nice and tough exchanges between Oscar Valdez and Matias Rueda; it gets three stars. Both undefeated, the Mexican Oscar Valdez entered this fight with a perfect record of 19-0-0 (17 KOs=89%) and he is ranked as the No.5 featherweight in the world (currently the #1 in this division is Leo Santa Cruz) while his opponent, Matias Carlos Adrian Rueda, has an official boxing record of 26-0-0 (23 KOs=88%) and he entered as the No.34 in the same weight class. Valdez has fought once in 2016 beating Evgeny Gradovich (=Valdez vs Gradovich) while Rueda has fought twice defeating Leandro Mendes Pinto and Nestor Hugo Paniagua. 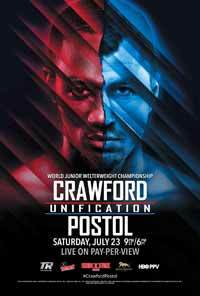 Valdez vs Rueda is valid for the vacant WBO World featherweight title; undercard of Terence Crawford vs Viktor Postol. Watch the video and rate this fight!